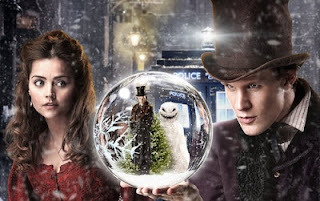 The Doctor ventures to Victorian England in 'The Snowmen', this year's Christmas special featuring Richard E Grant, Ian McKellen (alas, in voice alone) and best of all, Strax the Sontaran. Oh and new companion, Jenna Louise Coleman, in a curious role that suggests she will play a pivotal role in forthcoming episodes. Spoilers (marked) below. The Doctor (Matt Smith) has taken a leaf/hat out of Artful Dodger's wardrobe but this is not a source of joy - the sadness of losing the Ponds in 'The Angels Take Manhattan' still affects him, despite the best efforts of his motley crew. The gang of Strax, Jenny and her Silurian wife Madame Vestra have made a welcome return from 'A Good Man Goes To War', although it is Clara (Coleman) who coaxes the Doctor from his depression and misanthropy. Clara unexpectedly bumps into the Doctor, as well as a bunch of malicious Snowmen. Well, I say malicious - there is more than a hint of the 'Nightmare Before Christmas' about their look, which rather dampens the fear. They appear linked to the mysterious Dr Simeon, played by an appropriately grim Richard E Grant. Expectedly, the Doctor springs into action despite his earlier protestations, with Clara and the rest of the gang playing worthy supporting roles. Strax is the chief beneficiary of some hilarious dialogue from the oft-golden pen of Steven Moffat - "Do not attempt to escape or you will be obliterated....may I take your coat?" 'The Snowmen' suffers from certain contrivances and a slightly quizzical plot but also proves promising for the episodes to come. The lead up to the loss of the Ponds rather overshadowed the first half of the seventh series and this fresh break seems to have rejuvenated both the Doctor and the writers. We need to talk about Clara. 'The Snowmen' was a bit sneaky as we'd all heard that this was the proper introduction of new companion Jenna Louise Coleman, following her brief but excellent appearance in 'The Asylum Of The Daleks'. Well, that obviously wasn't quite the case but the call-backs to her dialogue in that episode were a good way of addressing the discrepancy - with the trailer for the new episodes suggesting she will play an integral role in future. Elsewhere, there were some contrived references to Sherlock Holmes and that dodgy "one word" exchange which was an over-long reference to the Ponds. Then there was Richard E Grant's unintentionally hilarious 'Thriller'-esque transformation into some sort of ice alien thing. It rather displaced any drama that had built up. Nonetheless, an above average 'Doctor Who' effort. Considering recent form, we'll definitely take that. Watch 'The Snowmen' on BBC iPlayer until 19:59 Sat, 5 Jan '13. Read our 'Doctor Who' reviews here.